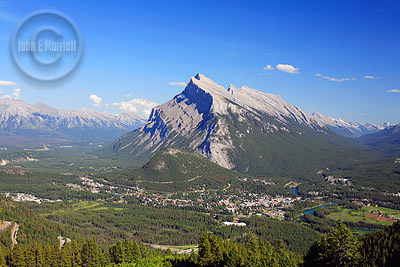 Locals that spend any amount of time in the Town of Banff quickly grow to love Banff`s infamous Green Spot, where a big green meadow on the slopes of Mount Norquay and Stoney Squaw provide an open view of the townsite below. Fortunately for landscape and nature photographers that have come to Banff to get great pictures, the Green Spot also offers up a wealth of photo opportunities of both grand scenes with the town included, as well as wildlife — the Green Spot often gets visited by a resident herd of bighorn sheep and occasionally hosts a bear family or two over the summer. To access the Green Spot, follow the signs from town for the Mount Norquay ski area and then watch for a rock wall on your right-hand side as you ascend the winding road towards the ski hill. If you make it as far as the ski area parking lots, you`ve gone about half a kilometer too far.